One of the reasons mental health problems can be so difficult and debilitating is that they tend to start when someone is quite young. Adolescence is a key developmental stage of the brain, which is not fully “adult” until the early 20s. Babies, children, and adolescents of all species need more sleep than their adult counterparts, mostly because it is thought to facilitate the growth and maturation of the brain. Those teenage years in humans, however, is when getting enough sleep can seem impossible. The general scientific consensus is that teenagers need about 9 hours of sleep every single night to be fully rested. Unfortunately, only 40% of middle schoolers get their 9 hours, and that figure steadily drops to just 14% of 9th graders and less than 5% of high school seniors. 17 year olds average 7.5 hours of sleep a night, and while that may seem close to the 9 hours that is needed, a chronic deficiency of even one hour of sleep has negative impacts on thinking, alertness, and functioning.¹ Chronic sleep deprivation is associated with physical signs of stress like higher blood pressure, low heart rate variability, and obesity. Mental health problems often go hand in hand with insomnia and decreased sleep; it’s not a coincidence that the teenage years are often when the first signs of depression, bipolar disorder, anxiety disorders, and even schizophrenia begin. While mental health problems definitely cause sleep problems, longitudinal studies of children and adolescents show that sleep issues tend to come first and may be causative in kids. For example, kids who sleep poorly have much greater risk of anxiety and depression as teenagers, but little kids who have anxiety and depression are not more likely to have sleep problems as adolescents. 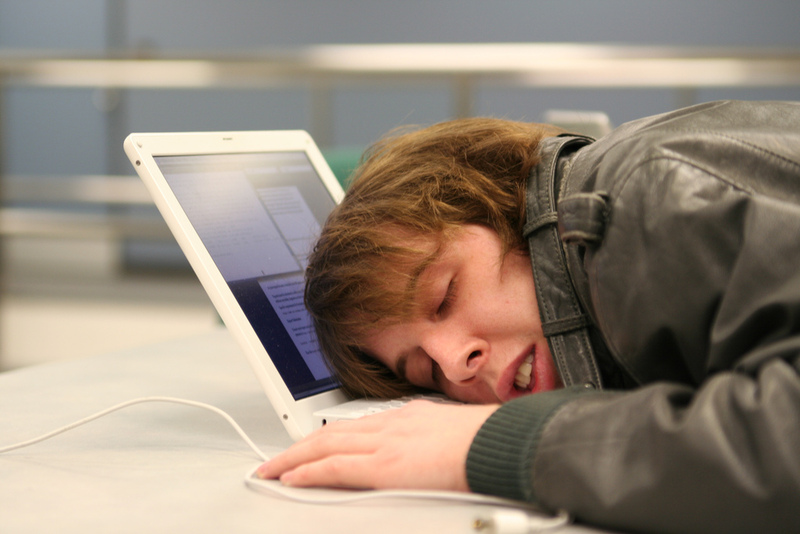 The reasons for the lack of sleep in adolescence are obvious and numerous. Increasing hours of homework, greater after school activities, clubs and sports, along with the advent of part time work to make some extra money or pay for the first car. There is now the ever present allure of electronics (in the past, teenagers had a reputation for talking for hours on the phone and watching TV well into the early morning… now it has morphed to texting, Instagram, Twitter, Youtube, and Snapchat). Teenage years are when many first begin to experiment with drugs and alcohol with their generally detrimental effects on sleep quality and sleep cycles. Teenagers are known for being “night owls” as well, finding it far harder to get to sleep at night. This issue is actually a part of brain maturation… as the neurons undergo their final “pruning” the amount of so-called sleep pressure that builds up during the day, making one drop off to sleep at bedtime, is considerably less in adolescents than it is in pre-adolescent children, so some may find themselves having consistent trouble getting to sleep for the first time. The overall sleep deficiency also leads teenagers to try to “catch up” by sleeping much later on the weekends. Unfortunately this practice contributes to more and more phase shifting, later bedtimes, and zombie-like mornings on school days. Telling parents to get their kids to sleep is far easier than the actual practice successfully establishing a strict bedtime. It is a natural part of teenage life to develop more autonomy and parents of teenagers must pick their battles. Managing electronics, keeping bedrooms free of bright LED lights that disturb sleep, and trying to keep a limit on after school activities might be some of the battles worth fighting. Conversely, scheduling morning activities on the weekend may help adolescents keep a better sleep cycle, and leading by example by demonstrating good, consistent sleep patterns as parents can be helpful. “Catch up” sleep doesn’t wreck the sleep cycle as much if it happens as a 60-90 minute afternoon nap rather than sleeping late. Because sleep is so core to physical and mental health, prioritizing sleep makes all the different cognitive and physical challenges of adolescence that much more efficient and easier. My previous two articles on sleep here on the 9 blog, Improve Your Mental Health With Sleep Part Iand Part 2 give very specific advice on how to make sleep better, and the same strategies that work for adults can be adapted for children and adolescents. Quality of life and mental health are much better with sufficient rest, and it is up to us to teach the next generation about the importance of sleep.